Page 9 has several paper based clippings related to a variety of different subjects. 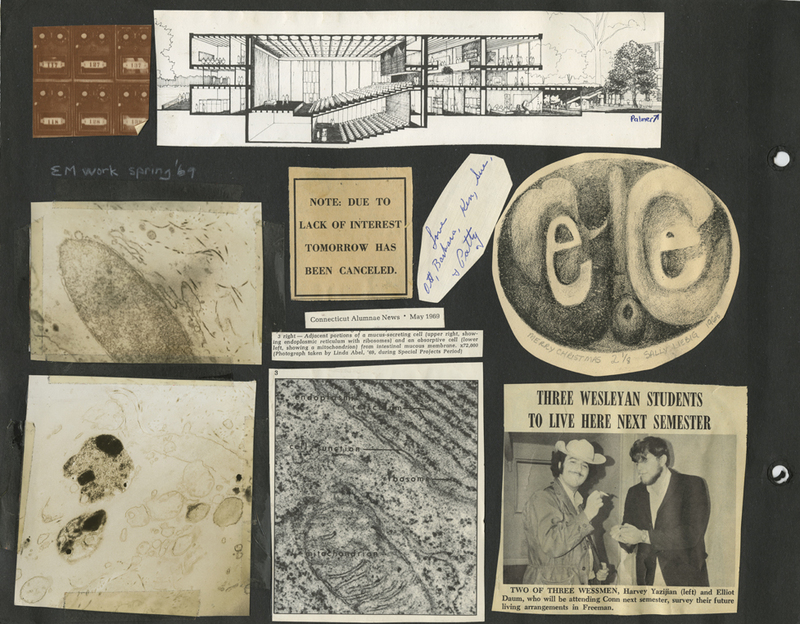 These include: a schematic drawing of the inside of the Joanne and Nathan Cummings Art Center from the late 1960s; three clippings of photographic images of microscopic organisms taken in 1969 with an electron microscope at Connecticut College; a circular clipping of an illustration with an unknown subject captioned "Merry Christmas 2 1/8 Sally Liebig 1968"; a newspaper clipping and image from an article discussing the three male students from Wesleyan who came to Connecticut College in 1969; and a small clipping of an image of college student mailboxes. 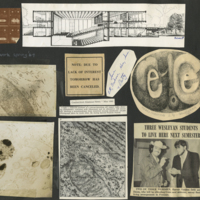 Abel, Linda Lee, “Linda Lee Abel Scrapbook Page 9,” Linda Lear Center Digital Collections and Exhibitions, accessed April 24, 2019, http://lc-digital.conncoll.edu/items/show/1094.